Holidaying in the wine regions of the world is one of life’s great pleasures. OK, not that many offer sandy beaches and hot and cold-running nightlife, but the combination of breathtaking scenery, uplifting culture and fine food and wine provides adequate compensation for those considering holidays in the vineyards. More and more wine estates are now welcoming paying guests, in everything from rustic B&B accommodation, to ultra-chic boutique hotels. The rise of ‘Vino-tourism’ has seen wineries around the world building fabulous guesthouses and opening their doors to wine-loving guests. Here, wine writer and globe-trotter Natasha Hughes and Tom Cannavan sample what’s on offer on both the European ‘Grand Tour’, and in more far-flung corners of the globe. Liz Berry MW and her husband Mike have been based in Provence for over a decade, and have established a reputation as exporters of top-notch southern French wines. Although the region is their first love, the selection of wines they chose for their Provençal Christmas Weekend proved that their oenophile interests span the globe.The weekend kicked off with a tasting of red wines that included a mature Rioja, a Barolo and a Californian Zinfandel. Along the way, Liz provided useful insights into matching the wines with the Christmas meal. An excellent dinner, which included home-produced foie gras and duck confit, was accompanied by a further selection of wines, the wine and food matches sparking lively debate.Morning visits to Arles’ colourful, bustling market and an afternoon visit to a Provençal gift fair were broken up by a lunchtime tasting of top-notch whites. The evening tasting of fortified wines was followed by dinner, when we were joined by Eloi Dürrbach of Domaine de Trévallon, and tasted our way through two vintages of his white, and five of his austere but characterful red wines. Sunday morning saw our small group in celebratory mode as we sat in the Berrys’ cosy living room and tasted our way through a selection of Champagnes that included Dom Pérignon and Krug. Liz had prepared lunch, accompanied by wines from Liz and Mike’s own personal collection.The Berrys’ warmth and generosity of spirit is the keynote of their wine weekends. Those lucky enough to join them this spring on their Fine Burgundy Weekend (10-12 March) or the Châteauneuf du Pape Course (12-14 May) will find themselves enjoying a complex blend of superb hospitality, delicious food and fascinating wines that will linger in the memory for many years to come. From £395 including accommodation, meals and wines. Contact Liz Berry, Tel: +44 (0)871 474 0635 or visit wine.weekends.monsite.wanadoo.fr. The art of matching wines to food has become increasingly fashionable in recent years, but few wineries harness this growing interest in any practical way – especially in the Old World. 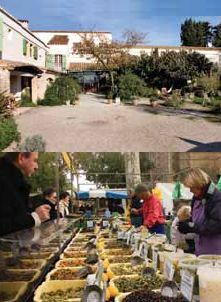 One exception is La Baume, which is located on the plains of the Languedoc, just outside Beziers. Its atmospheric farmhouse has been transformed into a culinary centre, where visitors can not only learn how to cook a wide repertoire of dishes, but can then sit down to enjoy them with a range of complementary wines. Small groups of up to six people congregate in the professionally equipped kitchen where Stéphane Dauge runs the courses. Dauge has worked in a number of top restaurants, as well as for chic Parisian traiteur Fauchon, but teaching is clearly one of his great loves. As he deftly demonstrates the correct chopping technique he drops handy little hints about the best way to deglaze a sauce or explains why mackerel isn’t suitable for making stock. Students are supervised as they make their first forays into filleting fish and are encouraged to try their hand at presentation, but on the whole Dauge’s style is one of demonstration rather than participation. To be fair, he is more than happy for students to contact him with any queries when they’re trying out the recipes at home.The courses are brief – a morning at most – and are popular both with visitors to the area and locals. Sessions are divided into those that focus on a particular ingredient – for instance, April is artichoke month and June’s class concentrates on lamb – those in which participants learn how to cook a two-course meal and ‘Divine Desserts’, where sweets take centre stage. Dauge, however, is infinitely flexible, and should you have a yearning to learn how to cook regional specialities, such as cassoulet or civet de sanglier – or any other dish for that matter, he is more than happy to accommodate requests. A word of warning – although Dauge speaks basic English, you really need to have at least some French to get the maximum benefit from his classes.Prices for the courses start at 30 euros per person. For reservations and more information, contact Paula Picornot on +33 (0)6 67 39 29 49 or email ppicornot@labaume.com. It’s not often you get the chance to take your cookery lessons in a monastery that dates back to the 11th century, but at Badia a Coltibuono, hidden deep in the forests of Chianti, that’s exactly what’s on offer. The monastery, with its pale, stone walls and elaborate knot garden, stands at the top of a hillside, and affords visitors a wonderful panorama of the surrounding countryside. The current owners bought Badia in the mid-nineteenth century, and today the estate is renowned for its wines, olive oil, and for a restaurant whose reputation has spread far and wide. 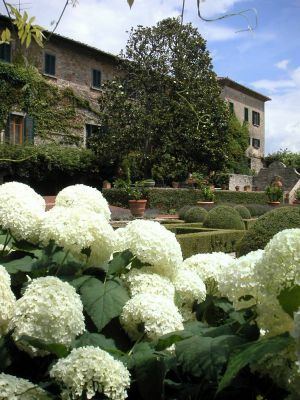 Guests can enjoy on-site bed and breakfast whether they’re studying at the cookery school, or merely using the estate as a base to explore the Chianti countryside. Lodgings reflect a splendour that the monastery’s former occupants never enjoyed. The monks’ cells have been turned into luxurious bedrooms that feel more like they belong to a private home than to a commercial enterprise.TV chef, cookbook writer and the mother of Badia’s current owner, Lorenza di Medici, founded the cookery school. Courses are held in well-equipped kitchens where slick mod cons belie the historic surroundings. They start with a one-day, hands-on session that includes a lunch of the dishes prepared in the morning accompanied by the estate’s wines, and a guided tour of the property. Participants signed up for the longer courses – which range in length from three days to five – get to enjoy a taste of the Tuscan lifestyle in addition to their time in the kitchen. These trips are an integral part of the courses, and might include dinner at a local palazzo one night and at Lorenza’s villa on another, a visit to an olive oil mill, an afternoon trip to Siena, or an excursion to Chianti’s pretty hilltop towns. They include a guided tour of the winery and plenty of opportunities to taste the wines, and if you happen to be at Badia at the appropriate time of year, a trip to see Siena’s famous Palio might even be on the cards.The recipes taught on these courses are resolutely Tuscan in character, and include breads, pastas and meat dishes – but the emphasis is firmly on local, seasonal produce, so autumnal classes will have a distinctly different flavour to those conducted in spring.Guests of the B&B get a ten per cent discount on the price of a one-day course, which otherwise costs E155 euros. The three- and five-day courses are residential, and cost between E900 and E2,750. Tel: +39 (0)577 744832 or visit www.coltibuono.com. The city of Salamanca is a jewel in the crown of Castilla y Léon, the former Kingdom in western Spain, where renaissance architecture fills the streets. If two beautiful cathedrals, one of the word’s oldest universities, and the magnificent, colonnaded Plaza Mayor aren’t enough for you, there is excellent eating and shopping too.Just a 10-minute taxi ride away is the bucolic vineyard country of the Duero, and one of the finest boutique hotels to be found in any winery. This is Hacienda Zorita, where 22 rooms have been formed from a Dominican monastery that was founded in 1345, and sits astride the Tormes River. Christopher Columbus was a resident at one time. The hotel and winery are part of a project named Haciendas Españas, and some of the grapes here find their way into the popular ‘Durius’ blend, on sale in the UK. Haciendas Españas is the passion of Victor Redondo Sierra, president of a large Spanish group of estates, which has been renovating historic wineries and erecting sympathetic new ones, each with a beautiful hotel to attract discriminating wine tourists into some of Spain’s most beautiful regions.The atmosphere of Zorita is spiritual, yet luxurious. The ancient buildings have been perfectly preserved, but with state of the art accommodation created within. The rooms offer a gorgeous blend of the high-tec (broadband, spa bathrooms) and the ancient, with stone beams, pillars and archways integral to the design. The style is minimalist, but design is cutting edge. 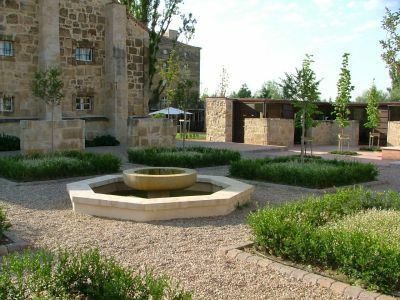 A new treatment spa opened in 2005.Guided winery tours run daily and are informative, including the old chapel, cellars and a video screening about the project, as well as a tasting of course, including estate wines, olive oils, hams and cheeses. The Zorita restaurant is good, without scaling the heights, but it does have the advantage of being steps away from bed, and having yet another stunning setting and reasonable prices.In fact Zorita and all the Haciendas Españas properties represent terrific value for money, with double rooms starting at around E110 (£75) per night. Tel: +34 902 109 902 or visit www.haciendas-espana.com. The Argentine province of Mendoza is an awfully long way to go merely to taste wine, and most people combine a trip to the region with a visit to the country’s capital, Buenos Aires. But in truth, there’s far more to Mendoza than its wineries. Lovers of active sports and wide-open spaces will thrill to the possibilities: the range of adventures is almost as wide as the Andean horizons. You can ride a raft atop the tumbling white waters that spill through the canyons of the Mendoza River, or hike high into the mountains to go fly-fishing for trout in some of the world’s most remote streams. Those who enjoy riding will appreciate the opportunity to see more of the stunning countryside from horseback. The Western-style saddles used in Argentina make the going relatively easy, and the horses, by and large, are of a calm disposition. Somewhat less active – but only just – tango lessons are the ultimate taste of Argentina. You can learn to smoulder your way through the world’s sexiest dance (it’s easier than it looks), or sit back and watch the experts demonstrate their skills.Alternatively, if you’ve got a hankering to learn how to cook typical Argentine dishes like empanadas and dulce de leche, book yourself in for a session with chef Pablo del Rio, whose enthusiasm is infectious and whose recipes are delicious. All of these activities can be experienced at Postales del Plata’s two lodges, one situated near Mendoza itself, the other further south in the up-and-coming Valle de Uco, home to such wineries as Clos de los Siete and Bodega Lurton. Postales del Plata specialises in tours that blend activities with visits to the region’s top wineries. While the lodge at Chacras de Coria near Mendoza is a haven of slick modernity – a visual blend of Santa Fe-meets-Mediterranean – the lodge at Uco is a peaceful country retreat. 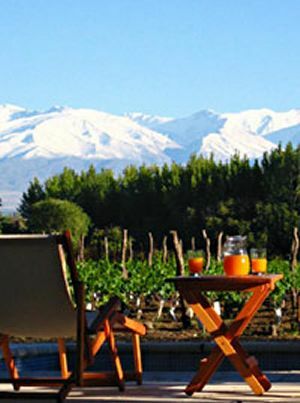 Surrounded by vineyards, it is so close to the snow-capped Andes that you could almost reach out and touch the peaks from your bedroom window. What a perfect place to recuperate from those adventurous excursions.Individual packages – which include accommodation and activities – cost from $395 US per day. Tel: +54 (0)261 429 6210 or visit www.postalesdelplata.com. 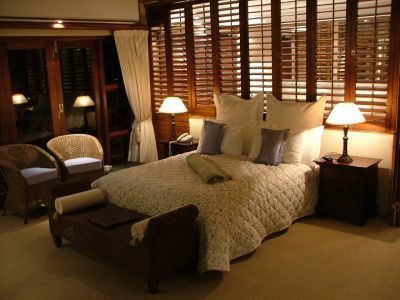 There are a number of fine places to stay amongst the vines in the Cape, with beautiful restored Cape Duh homes, whitewashed farm cottages and whole Manor Houses available to rent.Banhoek is a seriously luxurious five-star lodge, recently built in the Banhoek Valley countryside just five minutes from Stellenbosch. Each room has a wrap-around balcony with uninterrupted views over the vineyards of the Zorgvliet wine estate and onto magnificent mountains and valleys strehing far into the distance. This is a very exclusive guest lodge with just six beautifully decorated, spacious suites. There’s a terrific sense of being at one with the stunning surroundings, as a complete wall of glass forms one side of all rooms. Shutters separate the large, modern, spa-style bathroom, and can be folded back to create one vast living space, flooded with light and panoramic views. Earthy colours and natural fabrics are set against contemporary design and clean lines. There is an enclosed courtyard with a small pool and steamer chairs, and a private lounge with books, games and a fireplace to fend off chilly winter evenings. Breakfast is the only meal served (where smiling staff will cook to order if required), and is taken on a terrace above the vineyards on summer’s days. Guests are welcome to dine at the estate’s very fine and historic Herenhuis restaurant, which is in a separate building on the estate, and where the food really impressed on my visit.A car is necessary at this location, as nowhere is really within walking distance. The estate can organise vineyard walks, barbecues and other activities, but the peace, beauty and refinement of Banhoek are what makes it so special.Rates start around R1,000 (about £90) per person. Tel: +27 21 885 1791, or visit www.zorgvliet.com. Most wine-orientated visitors to Canada will head for either Ontario or British Columbia, where there is an infrastructure of restaurants, hotels and visitor facilities to make for very enjoyable touring.In BC’s Okanagan Valley I can heartily recommend Therapy Vineyards guesthouse on the Naramata Bench. In the midst of the vines, there are beautiful lake and mountain views and every home comfort (Tel: +1 250 496 5217 or visit www.therapyvineyards.com). 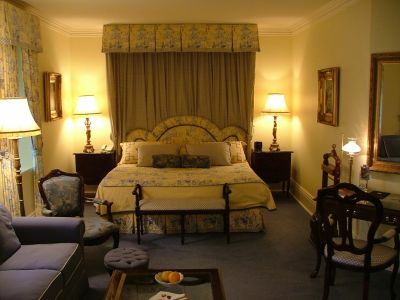 But as Therapy is really pihed at large parties taking over all eight bedrooms, I’ve plumped instead for the romantic and ultra-luxurious Prince of Wales hotel in historic Niagara-on-the-Lake. Niagara-on-the-Lake is in the heart of Ontario’s vineyards, and is one of the prettiest towns you will ever see. Festooned with flowers, the lovingly restored old town has a genteel air (especially when day-trippers from nearby Niagara Falls head home for the evening) and plenty of bijou shops, restaurants and leafy squares. It sits on the shore of Lake Ontario, with Toronto’s skyline floating in the haze of the opposite bank. A much-extended red brick building, The Prince of Wales once housed George V in its Victorian past. Today, the interior is decidedly Olde Worlde, with painted tiles, ornate parquet floors and stained glass windows. 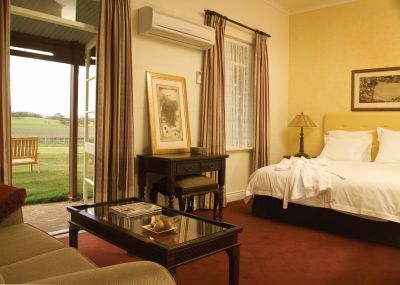 The 110 rooms and suites are extremely comfortable in a well-padded, traditional style. There are all mod cons though (min-bar, broadband, e) and the marble bathrooms are huge, with walk-in power showers and whirlpool tubs, robes, slippers and plenty of creature comforts. The hotel has a fine restaurant called Escabeche (do try the French toast for breakfast), which looks out onto the bustling main street, and if vineyards visits and fine dining leave you in need of rejuvenation, there is a heated indoor pool and dedicated Spa offering a range of therapy treatments.Room-only prices in the peak summer season are extremely high, when you can expect little change from $400 Canadian per night (about £200), but off-peak rates can fall as low as $99 Canadian and there are packages on offer. Tel: + 1 905 468 3246 or visit www.vintageinns.com. Peppers is the brand name of a group of very high quality boutique hotels across Australia and New Zealand, many of which are independently owned and run. The Hermitage is about as well placed as any hotel could be for visiting the wineries of the Barossa, sitting on the Seppeltsfield Road, next door to Penfolds and other top wineries. Shiraz vines run all the way to this hilltop property’s boundaries, and there is peace and quiet by the bucketful in this semi-rural location. With 15 very cosy but upmarket bungalow-style suites around a central courtyard, the Hermitage is owned and managed by a Californian couple, who came from the Napa Valley to recreate their vision of the ideal wine country getaway. Cookies, fruit and magazines are all provided in rooms, along with DVD players, spa baths and luxury toiletries. The décor is subtle and tasteful, and each room has French windows out to a private terrace, with access to the pool and sun deck. 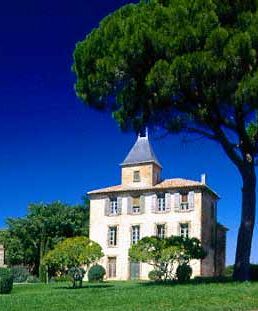 There’s also a Sauna, bicycles to borrow, and even a Boule court for sportier types.One of the best things about a stay at Peppers Hermitage is reputed to be the dining experience in Appellation, the hotel’s restaurant. Executive Chef is Mark McNamara, gold medallist in Tasting Australia’s national culinary competition and a much-admired cook. But on arriving for my one-night stay at 7:30 pm I neglected to tell the friendly reception staff that I’d require a table, and when wandering across to dine at 8:15 found the kihen closed and the dining room stripped and re-set for breakfast. Be sure to book is the moral of this story!Rooms for two include and excellent gourmet breakfast and newspapers, and range from $145 Australian to $220 Australian per night, depending on room type and season (£61 – £94). Tel: +61 8 8562 2722 or visit www.peppers.com.au.